Hello food-loving friend, Amanda and Sam here! We are so glad you found us.. Now go grab yourselves a cup of coffee or tea (or wine!) and let’s dive in. Do you struggle with food? Maybe you’ve been yo-yo dieting since you can remember. Maybe meal-prepping or eating vegetables overwhelms you. Or maybe you eat clean on the weekdays but then by the time Friday rolls around, you lose all control and say “screw it” from restricting yourself and you binge eat. Whatever you are struggling with, please just know that you are not alone and that is why we wrote this book! We want you to think back to before you ever dieted. If you are anything like us, it’s been a while, maybe since you were a young kid. You ate when you were hungry, you stopped when you were full and you ate everything you wanted in moderation. Ah, seems easy, right? Unfortunately, food has not been easy for either of us. We’ve struggled with years of yo-yo dieting, losing and regaining the same 5,10, and even 20+ lbs, and not knowing how to change our bodies despite working out in the gym. But after years of struggling with food, we know that it is possible for you to enjoy your life, feel and look good, while enjoying your favorite foods because we have both gotten to a place where we practice it daily. We know that meal planning shouldn’t consume your life and tracking calories isn’t a requirement for feeling good or staying lean. 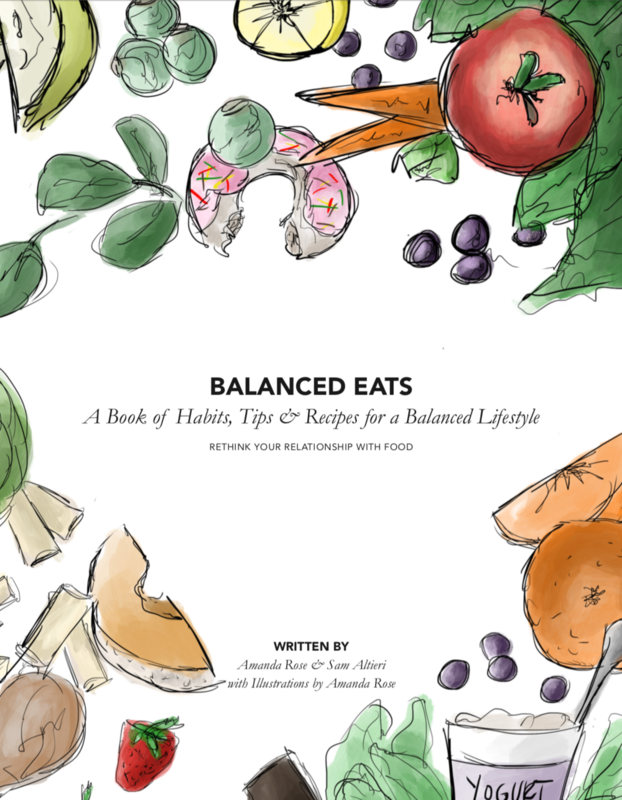 Our book, Balanced Eats, includes more than 15 years of combined experience in the kitchen and practicing (we are still working on it!) a balanced lifestyle. One copy at a time, our goal is to help you remember that you aren’t alone and that you have the power to rebuild your relationship with food and quit your self-sabotaging. Just because you have struggled with food in the past does not mean that you need to struggle with food for the rest of your life. If you are struggling, we get it. For a long time, our mindset around food was damaged. Sam struggled with emotional/stress eating and wavering between cycles of clean, restricted weekday eating followed by weekend binges. Amanda had a history of ignoring her cravings and hunger cues and struggling to give herself permission to enjoy more fun foods. Ultimately, our struggles were mostly in our head - we were telling ourselves a story that was sabotaging our fat loss efforts. When we realized how many of you struggle with the same thing, we decided we wanted to write this book to help you re-learn how to eat, mend your relationship with food and eliminate the dieting mindset you’ve recited to yourself for the past years. You have the power to rewrite your story, and our book, Balanced Eats, will help you do just that. Thank you so much for your support and for purchasing a copy of this book. We know how powerful it is to feel in control of your eating and most importantly, your life. Creating this book has been a milestone for both of us and tangible evidence acknowledging that our stories around food have been rewritten. Publishing this book has been such an emotional experience for both of us and we would love to hear from you if it makes a difference in your life. Please be sure to get in touch or tag us on social media if you buy the book (and actually enjoy it!). Much love and cheers to balance! Sam has a hard time deciding what she loves most: lifting weights, doing yoga or going for walks outside, but she knows she loves fish tacos, baby carrots, blueberry cake donuts and a nice glass of Malbec! Amanda Rose is currently a personal trainer and teaches classes for women on how to properly lift weights. She is also a digital illustrator and recipe creator. She currently lives on a farm in Halifax, VA and has 4 cows, 4 dogs, 2 cats and ducks (aka an unlimited supply of duck eggs!). Amanda loves to lift weights and is always down for a double IPA or a slice of gooey cheesy pizza.